We were up bright and early and preparing the cabin for departure. The passengers were all onboard and we were helping the last few who boarded to put away their baggage. We did our safety demo, secured the cabin, and before we knew it we were up in the sky. Our 6am departure actually left 20 minutes early! It was a very good start to the final leg of our trip. Alas, it seems it was too good to be true. After take off we were sitting in our jump seats waiting for the seatbelt sign to turn off so we could start preparing for that morning’s service. While we waited, our cabin manager started making her service announcements. She finished said announcements and started up again in French. Again she finished. Often the pilots wait for the announcements to be finished before they turn the seatbelt sign off; so I’m expecting to hear that ding! right about now. Still nothing. A few more minutes pass and finally I decide I’m going to call up to the front to see if the captain forgot to turn it off, or if he’s expecting turbulence. Either way I was looking for permission to leave the jump seat. When he made the announcements some of the other FAs I was with gave me nervous looks. I personally wasn’t too nervous. 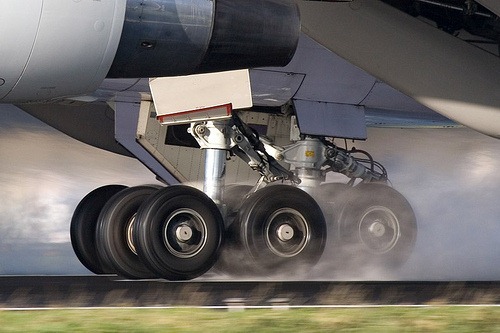 Of all the things to go wrong on an airplane I have to say having the landing gear stuck down is probably the best one. That being said I’m not a fun of unusual situations in the air. Once in the terminal the decision was made that the crew would be sent back to the hotel for crew rest. This way they’ll be able to prevent us from going over our maximum duty hours so we can operate the flight later in the day. On paper that’s a good plan, but have you ever tried to rest after having a full nights sleep? It doesn’t work that day. None the less, it’s only 4 hours. We made our way back to the plane to get our bags. As we walked past our passengers they asked “oh? Is it fixed now?” All I could say was, “We’ll have more information for you shortly.” That’s all I knew. Luckily the gate agents were getting lots of information and were doing an excellent got of relaying it to the passengers. After grabbing our bags we started heading for the exit. Some passengers noticed and said to us, “Wait, you’re going the wrong way!” Again, all I could say was “We’ll have some more information for you shortly.” Apparently right after we left, the passengers were asked to get their bags from the plane. Shortly after getting to the hotel I got the dreaded call that I’d been expecting. “The aircraft is indefinitely broken. You’ve been rescheduled for 9pm. We’ll call if anything changes.” I was expecting as much. A fully loaded 737 landed with full fuel tanks. Not only do they have to inspect fix and test the known problem with the landing gear, they now have to inspect for, repair, and test any additional damage from landing the aircraft overweight. That’s a process that can take quite some time to ensure it’s done properly. As I’m sure you can imagine. While in the hotel I tried to take a nap. I got about an hours sleep, but that’s about it. Finally the time rolled around to get back to the airport and try again. I was worried that the passengers would be angry, but I was pleasantly surprized to see everyone was in good spirits. It turned out the airline kept everyone well informed about the situation. On top of that they were all given meal vouchers for the airport restaurants, $150 in credit for excursions on this vacation or for use towards a future vacation with us, and those from out of town were given a hotel room for the day. The rest of the flight went smoothly. I was a little worried about the passengers we were picking up down south, but again they were kept well informed and in the end had an extra full day of vacation; complements of the company. Most everyone was on good spirits. Since their day flight had become a red eye, they all slept anyway. As for us; it was a very long day! We were supposed to operate a morning flight, and that’s what we slept for! According to our schedules, by the time we were leaving the hotel the second time to actually fly out we should have been landing in Vancouver. Needless to say by the time all was said and done, we were exhausted.